You may recall that a few years back I paid a visit to Shanghai and had some of their stinky tofu (aka chou doufu in Mandarin). At that time it was pretty much the only variety of stinky tofu I really knew of because I had spent a year living in that city. 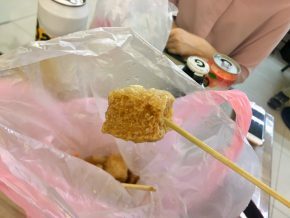 Stinky tofu, however, seems to come in as many flavors as bread or pasta, with Taiwan claiming one of its own. If you’re a longtime reader, you may recall a post from a few years ago highlighting the illustrious Chinese street food called Chou Doufu. Literally translating to “stinky tofu,” this dish can be smelled from blocks away and the smell is the antithesis of fragrant. For a long time, I thought this dish was relegated to Asia, until I read about a place in Gardena called Yami Teahouse that claimed to have that stinky bean curd. To my delight, it wasn’t far from my office and I might my way there to perk up my olfactory memory. If only we had smellovision. Just what is chou doufu (pronounced cho dough-foo)? If you don’t know Mandarin, you might think it sounds pleasant. The words roll off the tongue pretty cleanly and it sounds like it could be some sort of doughy deliciousness. Like a doughnut or something. But if you know Mandarin, then you know the true meaning of the words and they are nothing at all like a doughnut. 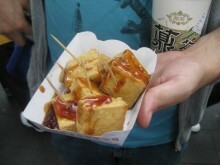 Chou doufu means, quite literally, stinky tofu. And the name is certainly appropriate. As with much of the rest of Chinese cuisine, chou doufu comes in many forms, but the form I know best can be found on the street.